To try to recreate the Nutella Skillet Cake/Torte/holy goodness Pichet Ong has brought to the table at his latest bakery, Village Tart. Whipping out his usual style of mixing savory with sweet, I focused on two of the sweet treats for my first visit. And I was rewarded two of the best treats I've had in a long, LONG time. After the closing of Batch and P*Ong last spring, New York City had to wait two seasons before being able to enjoy Pichet Ong's desserts again. The first of the new bakeries came with the November opening of Spot, it appears to be a high-end dessert bar that I unfortunately have not visited (hatred of St. Marks Place.) The second was the weekend opening of Village Tart, another sit down or take-away bakery. The interior includes a glassed off cafe, a lot of dark wood, and a large pastry selection. 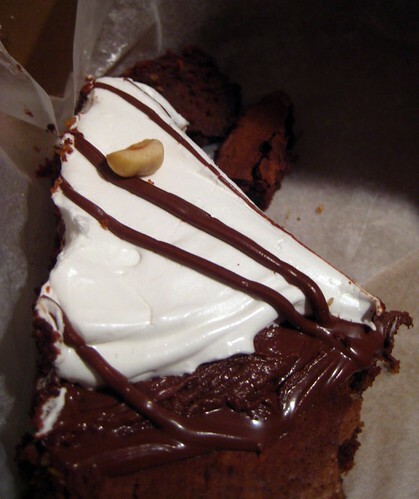 I immediately spotted the Nutella Skillet Cake, mainly because it looked like a s'more cake and the sign said "Nutella." Score and a half on this cake (or torte? My memory fails me.) 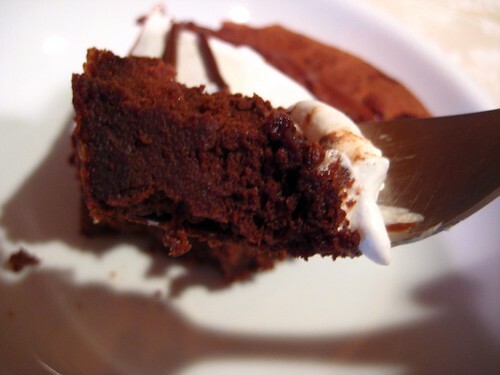 The cake part is a dense moist chocolate cake, not too sweet though, think more cocoa than chocolate. On top of that is a layer of Nutella, sweet nectar of the gods, it slightly soaks into the top layer of the cake. Sealing in the delicious is the layer of marshmallow creme, silky and creamy. 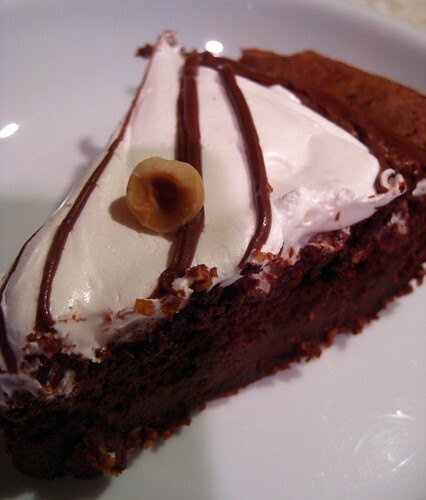 Chocolate, cake, hazelnuts, sweet cream, my newest favoritest dessert. Though there were various other desserts to choose from, I felt like a cupcake, picking out the Stracciatella from the three available. 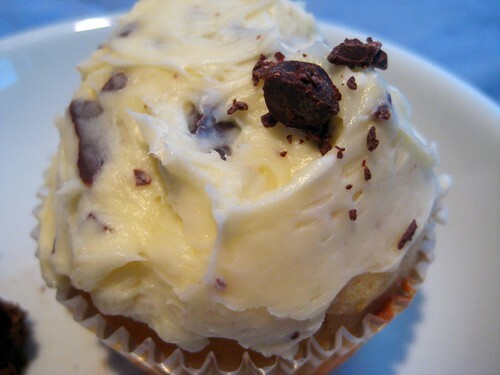 The buttercream frosting was perfectly done, not too buttery, not too sweet, loaded with chocolate chunks. 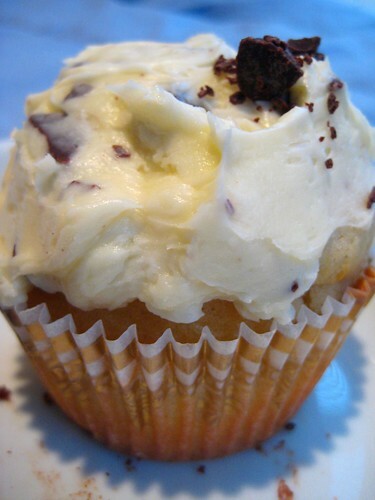 The cake was what makes this cupcake though. It's not a true vanilla cake, I tasted something else, something different. Buttermilk maybe? I kept thinking that it reminded me of corn bread and biscuits. Whatever it was, the cake was exceptionally moist and enjoyable. I have a new favorite spot, hands down. And I haven't even tried any of the savories yet, and those pizzas looked scrumptious. Color me cast-iron tickled. This I must try. These cakes sound so good, and the pictures are mouth watering. I love Nutella, and it's great to find someone using it state-side. (I used to munch it in London). I can't wait to try one of these delicacies. Nutella skillet cake sounds really good. "more cocoa than chocolate" is what I love about Pichet Ong's stuff. Thanks for the head's up. Ugh, really? I went there and I think all the praise is unwarranted. Awkward atmosphere, overpriced, good-but-nothing-special food...I really love Spot, however. I enjoy St. Marks a lot personally, but even if you don't Spot is worth it! Tasty Asian-ish desserts that literally sparkle! Yummm. And it's downtown, so my poor starving work-friends and I can actually go somewhere decent for lunch. Rad. anything with nutella has to be good! looks amazing!!! I ventured over to try this after seeing it on your blog. I was extremely disappointed. The cake was average. The nutella topping was meh. Could have used more hazelnuts. Did not care for the marshmallow topping at all. And at $5.95 a slice? Rip off! @anna: I think the same thing about some other big name bakeries that everyone fawns over. @anon: $6 is a little steep for a slice of cake, but it's comparable to Momofuku. I'm sorry that you found it disappointing. Yes, the price is comparable to a slice of cake at Momofuku. However, Village Tart's portion was about half the size of Momofuku's and the flavor was far inferior. FAIL.